Have you ever wondered what it's like to work as a tour guide? For people who are truly passionate about their city or region, and who enjoy constantly meeting new people, guiding is a dream profession. Just ask Maria, a local guide working out of Helsinki, Finland. "Good morning and welcome to Helsinki! 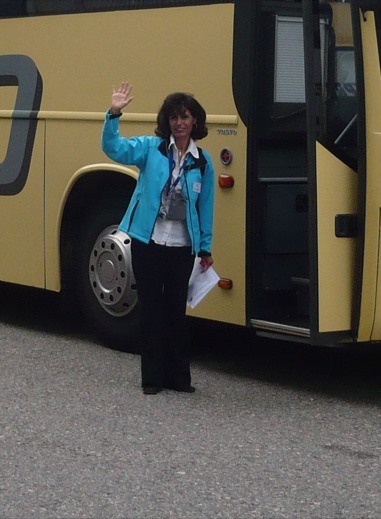 My name is Maria and it's my pleasure to serve as your guide for the duration of this tour." This is my customary introduction when greeting clients. I am one of Helsinki's approximately 300 authorized guides who host visitors from all over the world in around 25 different languages. In 2012 we notched up around 10,000 tours altogether. In guiding I feel I’ve found my dream job. Every tour day I meet people from all walks of life, I get to share my beautiful hometown with them, and they in turn share a small piece of their lives with me. Last year I had around 200 such opportunities to guide visitors in English or Spanish. No two clients or tours are ever alike. One day I might host a group of lively Mexican cruise passengers on a sightseeing bus tour. The next day, accompanied by a chauffeur and limousine, I might meet a wealthy American client at the airport’s VIP terminal for a customised private city tour. On one assignment I helped an Australian journalist gather material for an article on Helsinki. Later it was fun to see myself quoted as an expert on Helsinki in a publication produced on the other side of the world. We guides all have our most memorable tour of the season. For me it has to be the group from a Madrid Association of Down’s Syndrome Families last summer. Together we all explored Helsinki and the beautiful old town of Porvoo. During lunch I felt privileged to hear these wonderful families’ life stories and how they joined the association and its Baltic tour that ultimately led them to my bus. This tour was for me the highlight of my season. Helsinki hosts visitors all year round but during the summer months the pace really heats up. In addition to visitors arriving at Helsinki-Vantaa airport, during the busy five-month period May-September the city welcomes about 300 cruise ships with around 400,000 passengers. Many of them will want a tour in their own language, and this is where the tour guide steps in. It helps that I was once, like them, a newly arrived foreigner. I moved to Helsinki more than 20 years ago after meeting my Finnish husband when we were young students. I love sharing the knowledge and experiences of Finland that I’ve gained ever since. My own interests include history, cultural anthropology, linguistics and gastronomy. I try to weave these subjects into the fabric of my commentary, but only informally. No one wants to be lectured on holiday! My absolute favourite place to take visitors is Helsinki’s historic Senate Square – a magical place where I can just close my eyes and imagine the splendour of the period of imperial Russian rule. American groups like to hear how the Hollywood Epic Reds was filmed here – and I sometimes tell them how my husband, involved as a 13-year-old film extra, got a serious crush on the film’s starring actress Diane Keaton. Some visitors are surprised to learn that Finland has two official languages – Finnish and Swedish, or that Finland uses the euro, or that it was never part of the Soviet Union. I've shared with you all my most memorable tour, but what about the funniest tour? Well, I have my fair share of funny moments, too many to share them all here. I always tell my clients they can ask me absolutely any question they want to – though I can’t promise to have all the answers – and one Turkish group asked me why the statues outside the Railway Station were so serious. Another Spanish group complained that there were too many Spanish restaurants for their liking and that they wanted to see a Finnish one for a change. But one tour really sticks in my mind. A brave Ukrainian lady on a tour with her Spanish husband boldly asked me: “What's it like being married to a Finn?” – “Impossible to answer”, I replied, - “I'm still on my first husband!” We both burst out laughing! If you'd also like to share a laugh with Maria during a tour of Helsinki, you can reach her through her guide profile page.